Proper commercial kitchen shelves are some of the most important elements of a high-functioning commercial kitchen. Choosing the right shelves and formulating effective storage for ingredients, tools, containers, dishes and cutlery, and linens will help your staff work more efficiently and your kitchen stay cleaner. Additionally, in small kitchens, you can maximize your available space with the right shelving. Confusingly, however, there are a myriad of commercial kitchen shelves available — a variety of types, made out of a variety of materials and components, and featuring a variety of accessories. Below, we’ll outline what you need to know about choosing the best shelving options for your commercial kitchen and guide you through each type and variety. These shelves are ideal for cold storage. The ventilation allows for maximum product shelf life, and it’s much easier to see all items on your shelves through the slats. One-piece vented shelves can often be difficult to clean, but there are a number of shelving options available with removable grid mats to make clean up a breeze. These shelves are handy because smaller items won’t slip through the slats as they can with vented shelves. They’re easier to clean, but they do not offer the keen ventilation of vented shelves. For durability, stainless steel is excellent. It’s also naturally corrosion-resistant. It works in nearly any type of environment, from warm warehouse storage units to cooler storage. Any of the materials below can be antimicrobial when constructed. Essentially, an added layer of an antimicrobial agent is infused into the shelf during the manufacturing process to help prevent the growth of bacteria, mold, and mildew that can cause stains and odors. Epoxy coated is an ideal material for environments that get especially humid, such as in a walk-in cooler or places where dishwashing occurs. Epoxy is also optimal for protecting against corrosion. Chrome wire is perfect for heated environments or dry storage. They have great visibility and ventilation. Finally, polypropylene or polymer shelving is especially resistant to corrosion, and it’s even safe to be put in the dishwasher. Unlike other slatted shelving, these shelves tend to be easier to clean too. There are two basic types of mounting and assembly pieces for kitchen shelving units: mobile (those that move) and stationary (those that cannot be moved). For kitchens that are limited in size, mobile mounting may be ideal as units can be pushed aside and relocated when they’re not in use, creating more space. They are also handy when it comes time to clean behind the units. However, remember that most mobile units are more expensive. In kitchens with ample space and where rearranging is not likely, stationary mounting works best. It’s often difficult to decide the best possible arrangement of shelving in a kitchen. Naturally, it’s essential to put practicality first. Essential items that are used frequently need to be easy to access. Furthermore, items pertinent to a specific prep or cooking area should be closest to that space. Health codes and guidelines must be adhered to as well when arranging your shelving. For example, food items must be stored at least six inches off the ground. Inside storage freezers, it’s important not to block air vents. Ensure that you take ample time to devise an ideal plan for your new shelving in your kitchen. 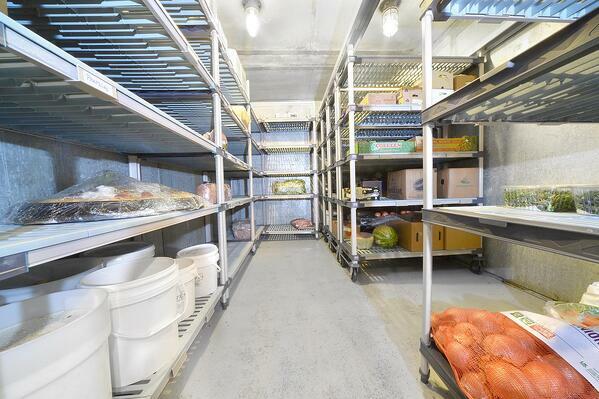 For more information about shelf organization, the best types of commercial kitchen shelves available, or what shelving options may be optimal for your kitchen, contact Metro today. Don't Make Bacteria Your Secret Ingredient: End Wet Nesting!